In 2017, most envisioned goals of additive manufacturing had materialized with the development of 3D printing (3DP) technology. Its explosive transformation from a small, go-to prototyping apparatus into a $12 billion industry is a story worth a mention. 3DP is expected to see more collaboration and innovation as we step into the future. What's next in the future of 3D printing? From Blockchain, high-speed 3D printers, IoT, and metal 3D printings - the answers are many. According to leading industry analysis, by 2021, 3D printing center of excellence will be established by up to 40% of manufacturing corporations. For 2018, expect to see the globalization of 3D printing, thanks to integrated software and automation of the standardized process. However, a temporary decline in demand is expected with the over-saturation of markets with cheap 3D printers. The makers of inexpensive 3D printers are likely to continue their stride until a shake-out this year which will push the demand even further for premium 3D printers that are highly accurate and utilize sophisticated materials. According to the predictions, Additive Manufacturing (AM) is estimated to touch $10 billion by 2021. This forecast is based on the current developments in the AM industry which is focused on building highly advanced machines that are larger, faster, and better in every way. The transformative power of 3D printing will be harnessed by identifying applications that can leverage AM technology. In the future, machine and software will embrace an application-driven approach to meet customer's demands. By 2021, 20% of global consumer goods businesses are expected to use 3D printing to meet the demand for tailor-made products. The innovation in 3D printing will allow manufacturing companies to exploit existing technologies instead of awaiting a mature 3DP technology. As 3DP technology makes headway, the industry's focus will shift towards processes in the pre and post-production stages. Although most of the tools printed using 3D printers are usable without extra finishing, some tools still require intricate finishing. The processes behind such efforts are expensive and involve a large amount of labor. Some operations in post-production stages that are time and cost-intensive can be streamlined by using pick-and-place robots. Fusing industrial automation and simulation software can lead to enhanced efficiency of post-production system without the superfluous intervention of operators. Simulation software is becoming a key part of pre-production stages because it helps in predicting failure in advance. This eliminates the overheads such as time and costs in the long run. In 2017, we witnessed reinforcement of 3D printing in supply chain activities that resulted in shorter lead time and production without tools. 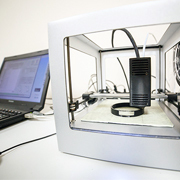 3DP is a proven asset with a broad range of applicability to handle resource-intensive tasks. 3D printing is predicted to smoothen the operation of manufacturing supply chains by integrating with existing ones and using transformative power to create a digital supply chain from the ground up. The proliferation of 3D printing in the manufacturing industry will lead to better collaboration between software, hardware, and service providers. It will fuel the production of highly-optimized products that are also easy to integrate. We predict that this industry will see more collaboration with its customers as well. Co-creation will become mainstream as it blends customer's market awareness with manufacturing knowledge and 3D printing software. Together they can lead to a transformative impact. Metal 3D printing is fast-emerging as an ultimate necessity because it is increasingly adopted to transform 3D designs into real models at a lower cost. It is estimated that by 2021, up to 75% of new aircraft will utilize 3D printed components. Although 3D printing using metals may never fully replace the traditional way of manufacturing products, it will continue to grow as a key part of lean innovation. In 2018 and beyond, metal 3D printing will become the go-to technology for prototyping commercial products and resolving complex manufacturing challenges. Outsource2india is a trusted name in the industry where the most reliable and industry-focused engineering services can be availed at cost-effective rates. We offer top-quality services thanks to the experience of our skilled engineers and project managers. We have over 20 years of experience being the trusted partner for many of our global clients. By outsourcing your engineering project to us, you can achieve peace of mind and successful results because we deliver better client experience along with measurable results. If you require a reliable partner to outsource engineering services, then your search ends here. Get in touch with us to know how we can be of service.